George Zimmerman, who has been in hiding since he was acquitted of murder in the death of Trayvon Martin, emerged to help rescue someone who was trapped in an overturned truck, police said today. Sanford Police Department Capt. Jim McAuliffe told ABC News that Zimmerman “pulled an individual from a truck that had rolled over” at the intersection of a Florida highway last week. The crash occurred at the intersection of I-4 and route 417, police said. The crash site is less than a mile from where he shot Martin. It’s the first known sighting of Zimmerman since he left the courtroom following his acquittal last week on murder charges for the death of Martin. 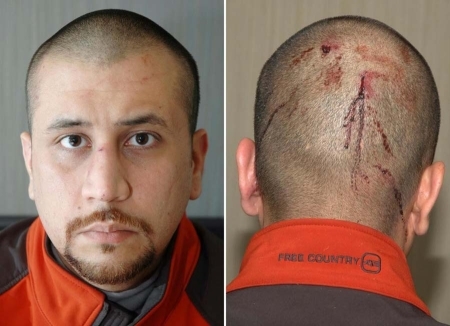 Zimmerman, 29, shot and killed Martin, 17, in Sanford, Fla., on Feb. 26, 2012. The jury determined that Zimmerman shot Martin in self-defense. Here’s the tweet of the day on this. The man was already found innocent in a court of law. It’s time for people to stop persecuting him.